Summary Pentium G620 six-drive BYOD NAS with USB 3.0, HDMI and optional 10 GbE ports, supporting multiple volumes and filesystems with many serving options. 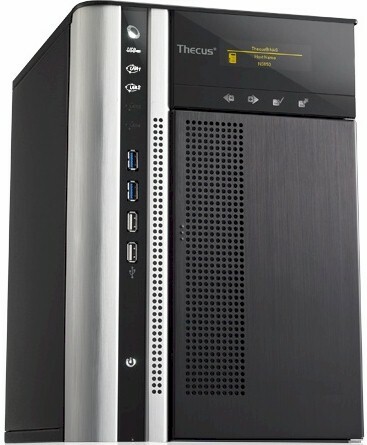 Thecus recently introduced its "TopTower" line of business-class NASes. All three are based on Intel CPUs, the N6850 using a dual-core 2.6 GHz Pentium G630 with 2 GB of RAM, the N8850 a 3.3 GHz Core i3 2120 with 4 GB of RAM and the N10850 running a quad-core 3.1 GHz Xeon E3-1225 with 4 GB of RAM. This review looks at the entry-level N6850 TopTower. Thecus has tried to spiff up the TopTowers, replacing the front panel buttons with touch-sensitive glass. The OLED status/info panel is still there and displays the same screens as before. The column of double dots running down the left-side of the front panel isn't just for decoration. When the system boots, it pulses a bright white, but thankfully extinguishes once the system is up. If there is a failure, the column will pulse once again, this time in red. The light show will continue until either the system recovers the volume or you log into the NAS admin and disable the light. This would be a much more useful feature if you could clear the light (and silence the buzzer) from the front panel, especially since you also get the red light show when a USB copy fails, something that's easy to do by pressing the wrong sequence of front panel buttons. The rear panel view below reveals some interesting features. The two unmarked slots at the top can hold optional PCIe expansion boards, one option being 10 GbE. There are both USB 2.0 and 3.0 ports as well as one eSATA. There are knockouts for two more Gigabit Ethernet ports, but you can't add any more ports there. Note there is no VGA port. Instead, you would use the HDMI port to attach a monitor for console use. Note also the User GPIO terminal blocks in callout 12. All the user manual says about these is "Could define each GPIO (0~7) and implement its own functionality". Thecus supplied four 1 TB Seagate Barracuda 7200.12 (ST31000524AS) drives for testing. They brought total power consumption with all drives spun up to 79 W. I also tried four of WD's new 3 TB Red drives, which brought power draw down to 73 W. I couldn't seem to get the system to spin the drives down to save power, even though I set spindown time to the 30 minute minumum. The N6850 is not a quiet system. It's not as loud as some rackmount NASes I've tested. But the constant loud drone from the case, power supply and CPU fans got old really fast. The system definitely deserves its loud sound rating.